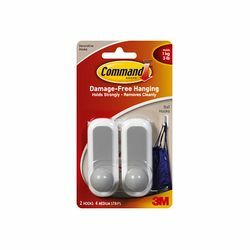 3M 17084S Command Ball Designer Medium Hook - Micro Parts &amp; Supplies, Inc. Stylish ball design medium hook with color accents. Command(TM) strips leave no surface damage and the hooks are reusable, creating an easy and affordable way to organize and decorate! Each hook holds up to 3lbs.